This is a fun little playlist. In my last Smart Playlist example, I showed how to create a list of the most recently added songs that had not reached a certain play count. Today’s list takes the opposite tack: what are the oldest songs in the library that haven’t been played a certain number of times. I call it “Eldest Tunes” and it is a great way to give attention to songs in your library that have, for whatever reason, found themselves neglected. I’ve found it to be particularly good for reminding yourself just how much you loved those songs of yesteryear. Before I continue though, I have to point out that if you started your music collection before July 2002, then this playlist works best if you’ve back-dated your library’s Date Added field. Songs must be in my master playlist. If you haven’t set up a master playlist, then you can leave this criterion out. This number is arbitrary and can be whatever you want. In my case, I want to find songs that have been played 0-3 times. When a song reaches 4 play counts, it can no longer appear on this list. This is a recycling mechanism. If, like in my example above, you’ve set your threshold to 4 and then listen to a song that only has 1 play count, the count increases to 2 and the songs stays on the playlist. When I first put this playlist together, I found that I was listening to the same songs over and over again for that reason. It was taking multiple listens to rise above the 4 threshold that I had set. So I added this rule that says once a song has been played it is “embargoed” for 3 months, giving other songs an opportunity to be heard. This is the actual engine of the playlist. Limit your playlist to the number of songs you want, but make sure you select least recently added. That least recent part is why it’s important to have accurate info in your Date Added fields. iTunes uses the date in that field to determine which songs will go on this playlist and in what order. In my case, the oldest songs that currently appear on my Eldest Tunes playlist are from Primus’ Pork Soda and Blind Melon’s debut. I originally bought them over the summer 1993 (backdated in iTunes), but I’ve hardly listened to them in the past few years, so their play counts are low. But now that I’ve seen that they’ve been under-appreciated for so long, I can take steps to give them them proper consideration. As for your playlists, I wish you happy listening! A rambling, self-indulgent, inconsequential post about habits, statistics, speculations, accumulation and missing data. I can’t help but be disappointed that I can’t see lifetime stats for my music listening habits. In these days of play count-tracking programs like iTunes and websites like Last.fm, it’s easy to get caught up in the musical trends of your life. It’s especially interesting when you look at the numbers and discover that you perhaps don’t like a certain style of music as much as you thought you did or you find that you listen to a particular band much more than you would have guessed. The problem is that your revelations are only going to be as good as the data you’ve collected. I’ve been a “serious music listener” for about 16 years, yet Last.fm has only been tracking my habits for three and my iTunes library only goes back six. I have ten years worth of listening that I will never have any way to quantify simply because the data was never collected. Missing data, of course, skews results and in this case, snapshots of my habits are skewed in favor of recent years, especially when looking a cumulative lifetime stats. Using data from my library as it stands today, I put together a graph of my most popular years in music. I’ve been for the most part, a contemporary music listener, so the vast majority of my library contains music released from 1993-2008, adding new releases each year. This graph shows the distribution of all my play counts generated since July of 2002 (when iTunes began recording them). 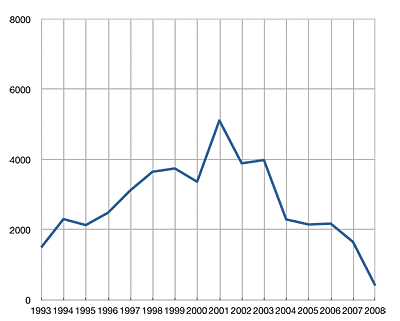 We see a peak in 2001 and a general downward slope since. My explanation for the shape of the graph is that, as years come and go and a music library grows, newer music receives more attention than older music. Familiar tunes give way to new acquisitions and explorations. However, those old tunes never entirely go away; they continue to co-exist with the new ones. As the years pile up, each one’s presence is diluted among the rest and it becomes and increasingly uphill struggle to for the songs of a new year to reach parity with those of the past. So in this particular graph, I attribute the 2001 peak to the simple coincidence that the songs from 2001-early 2003 were in high rotation at the time that iTunes started tracking play stats. As a result, the initial rate of change for those songs was quite high. And even though the rate at which those songs get played has decreased (exponentially) over time, the songs from other years still have to compete with them for attention, so we find a general trend decreasing cumulative play counts. Further evidence of this idea can be seen in the average play count for the songs of each year. 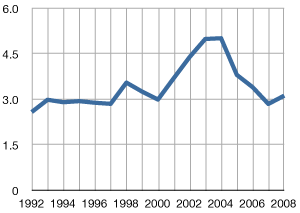 There’s a bump in the 2003-2004 area, reflecting the idea that older songs tend to accumulate more play counts over time. I can’t help but wonder what that play count graph would look like if iTunes had been released in the early 1990s? How much cumulative lifetime play would we see throughout the years? Of course, there’s no way to figure that out. That information is trapped in the fog of memory, stored in transitory listenings of cassette and compact disc. But while that individual play counts may be lost forever, it might not be impossible to make a decent educated cumulative guess. I’ll start with the premise that from the years 1993-2001, I averaged a mere 10 songs per day between school bus rides, studying, hanging out, commuting and partying from early high school, through college and my entry into the workforce. That’s probably a conservative estimate, considering the general lengths of my bus rides and commutes. Heck, I’ve managed to generate nearly as many plays in the past 6 months, and I’ve lately been slacking on my music listening in favor of podcasts and audiobooks. But 10 is a good number, so I’ll stick with it. So, at 10 songs per day, that’s 3650 plays per year. Consider the state of my collection in those early years. Throughout high school and into college, I managed to add records to my library at an average rate of one per week. If iTunes had been around at the time, play counts by now would be heavily concentrated in those early additions, with the highest concentrations being in the earliest records I bought. By the end of the first year, my estimated 3650 plays would be spread among a mere 500ish songs, an average of 7.3 per songs. By the end of the next year, another 3650 plays would be spread out among about 1000 songs, 3.6 per song. Except that I expect that drop off in older songs to be exponential, not linear. The blue line is the same as above, showing the cumulative distribution of play counts by year of release in my iTunes library. The green line represents what the graph would look like if my estimated historical plays were added to the existing totals. 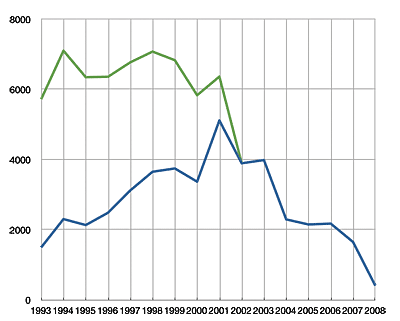 What does this totally unscientific, made up graph tell me? Basically what I already suspected: that I’d have to stop listening to my older tunes altogether and for a long time if I ever wanted current tunes to “catch up.” Of course, in the time it would take to do that, future tunes would be at a deficit. So really, while it’s a somewhat nice visualization, in reality it will have no bearing on my future plans. I’ve mentioned before that one of my standard library organization procedures is to back-date the “Date Added” field for all the songs in my iTunes library. 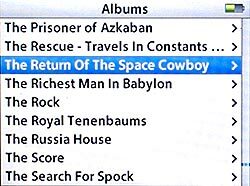 That is, if I originally received an album for my birthday in 1999, I make sure the Date Added field in my library is my birthday, 1999. Same goes for every CD I’ve bought or mp3 I’ve downloaded. Unfortunately, Apple for whatever reason, has decided that the Date Added field should not be user-modifiable. You can’t change it yourself, either manually or via AppleScript. And honestly, I’m tempted to think of that behavior as a bug/product defect. 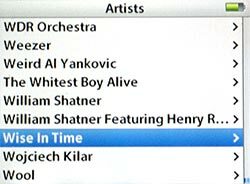 In this digital age, where at some point each and every iTunes user *will* have to rebuild or replace their library after some sort of data catastrophe, it seems like an obvious feature to be able to reconstruct one’s musical history chronologically. Why should users have to settle for the post-reconstruction dates for albums they’ve actually owned for years? Well, there’s a bit of a workaround, but it is a tedious one. So make sure you regularly backup your iTunes Library file so that you don’t have to do it all over again in the event of a hard drive crash. I use my .mac/Mobile Me account to upload my library file to my iDisk every night at midnight. The secret is that iTunes relies on your computer’s system clock to assign the Date Added to songs in the library. So back-dating is as “simple” as changing your computer’s clock, dragging your music files into iTunes, then resetting the clock to the current time. If you have hundreds of albums to do this with, the procedure can get quickly tiresome. Unfortunately, there is no way to automate it. Plus, if you are trying to fix songs that are already in your library, you have to remove them, change the system date, then re-add them. In those cases, make sure you note the play counts and star ratings, because you’ll have to re-enter those manually. Like I said, tedious. If you are using Mac OS X 10.5 (Leopard) and you use iCal alarms, be sure to disable them in Preferences before setting your clock back. I found this out the hard way when I was suddenly flooded by couple hundred notifications for events that had already passed. It seems that iCal travels back in time with you, then when you return to the present, it feels the need to update you on all the stuff you missed. With more than 16,000 songs to manage, there is no more essential a tool in my library than iTunes’ Smart Playlists. From building simple playlists for listening to creating complex queries for examination, Smart Playlists turn what would be a tedious burden into a trivial task. At the moment, I have more than 50 of them slicing, organizing and corralling my expansive collection of tunes into an easily navigable, self-sustaining ecosystem of music. It seems a shame to keep all those playlists to myself when they could be benefiting other iTunes users, helping them find new ways to organize and listen to their libraries. On this first of a new tunequest segment, I’ll share some of the criteria for playlists that I’ve developed to help manage my library. This first installment is a two-for. We’ll start with the foundation of my listening habits: the master tunequest list. The master tunequest list was one of the earliest Smart Playlists I created. 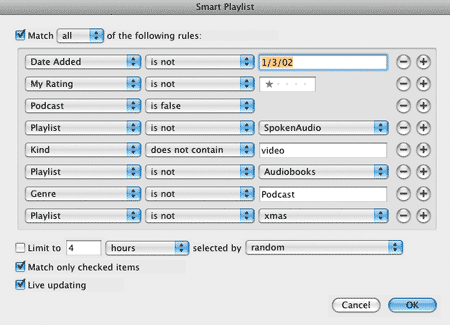 Its job is to act as a filter on the main iTunes library and determine which files are eligible for inclusion in other Smart Playlists. The premise is that only properly tagged music without any playback glitches should be included in subsequent lists. Podcasts, audiobooks, iTunes U courses, videos and other files that are not strictly musical should be excluded from the standard rotation. But how to do it? Date Added is not 1/3/02. I had a major hard drive crash on 1/2/02 which wiped out an early version of my Library. When I restored it from back up the next day, I discovered that the id3 tags for 5 years worth of mp3s had only been made on the library, not the back ups. I took the crash as an opportunity to re-evaluate my songs and make sure that all my files were “up to code” with proper tags and acceptable bitrates. When Smart Playlists were introduced later that year, I didn’t want songs that I hadn’t checked going into my rotation. With the Date Added for all 7500 songs (my library size at the time) set to 1/3/02, I was easily able to exclude those songs that were pending evaluation. After evaluation, I re-imported my songs with the appropriate Date Added and they were automatically re-included in the master list. Today, about 200 rather obscure songs remain that I haven’t had the wherewithal to track down, so excluded they sit. Date Added is a powerful tool for segmenting your library based on time period. You can set it to before, after or between dates to isolate just those songs, like a “Songs of Summer 2005” playlist (Date Added is in the range 6/1/05 and 9/1/05). Rating a song 1 star is my arbitrary way of taking a song out of circulation. If I notice a song has glitches or that its tags have errors, I’ll mark it as 1 star until such time as I can fix it. I have several playlists of just spoken audio that isn’t an iTunes Audiobook: iTunes U courses, comedy albums and other spoken word pieces. These playlists are kept in a sidebar folder called “SpokenAudio,” which iTunes treats as a single unified playlist for the purposes of Smart selecting. You can create some complex hierarchies and conditional listening schemes using nested folders and playlists. Keeps all video content off the list. Movies, TV shows and video podcasts are not welcome here. Keeps files from iTunes’ Audiobooks sidebar from mixing with music. iTunes offers similar selectors for Movies and TV Shows as another way to exclude video content. Another method to exclude podcasts from everyday listening. I have a playlist dedicated to Christmas and other holiday tunes. This selector keeps it out of the way for ~330 days of the year. I remove it on or around Thanksgiving and replace at after New Year’s. Now that we’ve cordoned off our healthy files, we can slice and sub-slice it to fit as many different listening schemes as we have whims. This is a relatively recent playlist I’ve been using to handle new music. Some music falls through the cracks around here. Some albums get overshadowed and as time marches on, they don’t get the attention they deserve, receiving only cursory glances before being supplanted by newer music. This playlist is meant to allow all new acquisitions to have an full opportunity for listening. The master list ensures that only “safe” music is eligible for inclusion. I generally feel that 3 plays per song is enough to consider a new album adequately vetted. You can adjust it to suit your tastes. This limiter means that the 150 most recently added songs that have been played 0-3 times (and are on the master list) will be included in the playlist. When one song on the list reaches 4 plays, it disappears from the list and is replaced by an older song that meets the criteria. When new songs are added to the library, they automatically appear on this playlist, pushing off older songs. Since I implemented this playlist, I’ve been able to keep a handle on the inflow of new music into my library. Enjoy. My original High Impact formula had a fundamental flaw, which I think I may have fixed. I spent the last post talking about the albums that made the biggest “impact” on me during 2007, but what exactly does that mean? Over the summer, I came up with the general concept, which basically defined impact as the average number of times any particular song from an album or artist in my iTunes library had been played, showing who has received the most attention relative to their presence in my library. Add together the play counts of all songs by an artist or on an album, then divide by the number of songs. There’s the impact score. In cases where an artist has a low number of songs, each play count is “worth more” in relation to other artists. A single play by an artist with only one song nets that artist a full “point,” whereas as single play by an artist with 20 songs would only gain .05 points. The solution I devised at the time was to set a threshold for inclusion, eg. artists must have more than 5 songs in my library to be ranked. Total Play Counts [squared] divided by the number of songs. This is essentially the same as the original formula, except that the total play counts an artist or album has received is multiplied by itself. The effect of this is to give the impact of a single play more weight as the number of songs increases. My thinking goes like this: albums with a lot of songs should rightly have a larger impact vs those which have fewer, even when the average play count is the same. Suppose we have an album with 10 songs on it and an EP that has 4. Each song on both albums has been played twice. Eight (8) plays gives the EP the same impact as the album that has received twenty (20). Even though both recordings have been listened to the same number of times, the album’s larger footprint leaves a greater impact score than the EP. The best analogy I can think of is mass vs speed. More songs equal greater “mass.” More plays equal greater “speed.” Just as lighter objects have to travel faster to hit with the same amount of force as heavier objects, an artist with a lighter presence in my library has to be played more times to have the same impact as an artist with a lot songs. A ping pong ball must travel at higher speeds to equal the same force as a baseball. This table below shows the formula in action. The two singles by Tomoyasu Hotei and Molotov vs Dub Pistols happen to be in the top 20 most played songs in my library (out of ~16000). That showing places each of them relatively high on the list, but not overwhelmingly so, considering the differences between the various AVG play counts. That’s an equitable result I’m pretty happy with. I’ve spent the past couple days playing around with Alex King’s iTunes Stats program. It’s written in PHP/MYSQL and requires a web server to run. With the MAMP one-click server running on my PowerBook, I had little trouble installing the program (though I did have to substantially increase the PHP timeout setting so it could handle my large library). iTunes Stats reads XML files, one can load an entire iTunes library or export playlists for more selective examinations. The program also comes with a number of built-in reports, such as Most Played Albums, Most Played Artists. Top Rated Albums/Artists and the option to weight by number of rated songs and play counts. The engine supports adding custom reports, so if you are motivated enough, you can create new methods of analyzing your music. My PHPMYSQL-fu is not very strong virtually non-existent. Still, I was able to cobble together my own metric: Artist Impact. An Artist’s Impact is measured by the total number of play counts they have received divided by the number of songs that artist has in the library. For example, Artist A has 20 songs in the library and those 20 songs have been played a total of 100 times. Thus, 100/20 = 5. That’s Artist A’s Impact. Basically, it tells you, the avergage number of times a song by that artist has been played. This formula is a way to compensate for the bias present when some artists have significantly more tracks than others. In my case, I have 329 songs by film composer Jerry Goldsmith. He has an inherent advantage over say, The Breeders, who have 63 songs in my library. By virtue of being so prolific, Jerry is naturally going to have more play counts. After playing around with it a bit, I’ve made some interesting observations. Firstly, the top 21 most impactful artists in my library, with one exception, have only one or two songs. In cases where an artist has a low number of songs, each play count is “worth more” in relation to other artists. A single play by an artist with only one song nets that artist a full “point,” whereas as single play by an artist with 20 songs would only gain .05 points. Fortunately, I’m able to set a threshold for display, keeping outliers from being counted. Here’s my top ten High Impact Artists. The artist must have at least five songs in my library. Additionally, this list only takes into account “popular music” (excludes classical, live shows and film/tv scores). I’m very surprised to see Jet in the number one spot. That’s because my affinity for the band has waned to virtually nil. Still, it’s hard to argue with the dent Are You Gonna Be My Girl? made in my listening habits back in ’03. The ironic part is that overall, I didn’t care for Get Born, so I ended up deleting five of the thirteen songs on the album. Those weaker songs aren’t there to dilute Jet’s Impact by lowering the ratio of play counts to songs, so the band’s number seems artificially inflated. Overall, I’m having quite the enjoyable time playing with iTunes Stats, even though it’s a little rough around the edges. I’m working on a couple of new reports and have even figured out how to get it to tell me which albums are missing ratings and how many ratings need to be completed. Remix albums and DJ albums have always proved a challenge to tag in a useful and logical manner because of how they differ from the traditional song-artist-album tagging model. Like compilations, remix albums typically include songs by a variety of artists and musicians. But they are released under the banner of a single artist and it is that artist that I associate that album with. For example, the album Brazilification has tracks by 18 different artists, all remixed by Fila Brazilia. Most, if not all the songs had been published before on each of the remixed artist’s own records or singles, but Brazilification collects them all and releases them under Fila Brazilia. Oh what to do, what to do? The standard tagging fields don’t offer a clean way to deal with remix albums, so I’ve had to cobble together my own solutions. The methods I use have to be simple and straightforward to use on an iPod, whose navigation options is more limited than iTunes, but it also has to include all the pertinent information, song name including remix title, remixer, original artist and the album (plus genre and year). Below are the two approaches I’ve developed. Neither one has really worked to my 100% satisfaction, though. This scheme is the more predominate one in my library. I’ve been using it for a long time, but have never been that happy with it. In a sense, the remixer is treated as though they have created a cover version of the original. Iin my mind, I associate the remixer/dj as the primary artist. It does have their name on the album cover after all. Thus, using the example above, Fila Brazillia is listed in the Artist field. The album tag, of course, is the album name. This way, I can easily navigate to the album on my iPod, glance at the track listings and see both the original artist and the song title. To make locating remixes in general easier, using my Composer tag guidelines, I identify the original artist again in the Composer tag, but surrounded by parentheses to separate them from actual composers. This approach doesn’t work semantically. It puts inappropriate data in inappropriate fields in order to make the system function. To continue with the example above, song is technically titled Climbing Up The Walls (Fila Brazillia Mix) and the actual artist is Radiohead. If I had a copy of Radiohead’s Karma Police single, where the remix originally appeared, Radiohead would, quite properly, receive the artist tag. Also, The scheme doesn’t play nice when my iTunes library interfaces with third-party applications. The song above is submitted to Last.fm as Fila Brazillia – Radiohead: Climbing Up the Wall, which acheives a disservice for both artists. On the site, it pollutes Fila Brazillia’s database of songs and at the same time, doesn’t provide proper credit to Radiohead. Because the Artist tag has been misappropriated, this contorted design can interfere with statistics. And anyone who’s spent time around here knows that when it comes to my iTunes library I’m a statistics nut. Brazilification using this first method. click to enlarge. Additionally, I find it redundant to enter the original artist in two different places. I’ve been relatively unhappy with the scheme, so I recently began to explore other options. The original artist name. (Ex. Radiohead). Gives appropriate credit source artists and allows them to be included in Smart Playlists that factor artists. Under this configuration, there would be multiple artists on the album, so the Compliation check box must be checked. Takes the form of Remixer/DJ: Album Name (ex: Fila Brazillia: Brazilification). For easy identification when browsing. However, it does present another semantic problem in that it offers more information the album’s actual name. So the remixer could be left out. I’ll have to see how it works in practice. Song name (remix) (ex: Climbing Up the Walls (Fila Brazillia Mix). It’s only appropriate to give each song its appropriate name. The remixer, again surrounded by paranthasese to keep it separated and sorted from actual composers. Instinctively, I like this design. I’ve not really had a chance to implement it on a large scale, but it holds potential to address the concerns I have with my current scheme. Yes, it still has some redundancy, with the remixer listed both in the song name, album title and composer tag. However, with direct compilation support on newer model iPods, the use of the remixer in the album or composer tag could be omitted. Using the Album Artist tag to identify the remixer/dj would actually solve all the problems with this plan. But the iPod’s current lack of support for the field leaves me having to use these workarounds. Let’s hope that Apple adds that increased functionality soon. In any case, this new tagging format promises to make it rather easy to locate and identify all the songs, artists and remixers in both iTunes and the iPod. It also will work with Last.fm submissions and sorts everything nicely for my all-important statistics. To be sure, it looks like an impressive device. But I probably won’t be buying one for two principal reasons, neither of which is the fact that I don’t have an HDTV set. Having been a participant in the digital media revolution for 10 years, I see some parallels between the state of video today and the state of audio in the late 90s. A decade ago, you were lucky if you had more than 10 GB of internal storage in your computer. 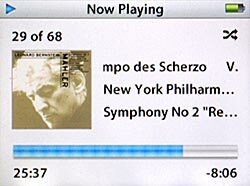 With the overhead of operating systems and applications, there was a limited amount of storage on that drive for the MP3 scene’s early adopters. Even at just 3 MB per song, that drive would fill up fast. An external drive would cost you $300-400 for 6 GB of space, but that too would fill up before too long. At the time, one solution was the small, but growing market for writable CDs, which cost about $2 for a single 650 MB disk (in addition to the several hundred dollars for the 2X burner itself). Similarly, while storage conditions have kept pace with growing file sizes, today’s digital video market faces some of the same logistical hard disk challenges for the end user. Apple’s own estimates say that a 45-minute TV show will run you 200 MB and a full-length movie is 1.0-1.5 GB. A modest collection of 100 movies will cost you 100-150 GB of hard disk space. Add to it complete TV seasons and expect that to grow substantially. Using Apple’s numbers, the entirety of the Star Trek franchise would use ~155 GB of disk storage. To be sure, today’s hard drives are indeed up to the task of holding a large video library. 500GB disks can be had for less than $200, ensuring plenty of room for an expanding selection of movies. But whether you encode videos yourself or buy from the iTunes Store, that library will represent a hefty investment of time and money. And the most dreaded event in computerdom can wipe it all out in an instant: a hard drive crash. Any reasonable, non-risk-taking person is going to want to implement (and practice) a regular backup plan for their media. The most convenient choices are to purchase a second (and possibly third) drive to house copies of all the video files, or make regular trips to the DVD-R burner for offline backups. The hard drive option would offer nearly instantaneous recovery to an iTunes+AppleTV-based media system, but it would double (or triple) your upfront costs. Additionally, if and when one of those drives fails, it will have to be replaced at the current market price for hard drives. True, the arguments I made in defense of digital music can apply to digital video as well. But, for the present, there’s a matter of scale which makes the effort more cumbersome for video. Plus, a music library containing a large number of songs with short playing times benefits more from the instant accessibility and portability of the iTunes+iPod model than a video library with relatively few entries and long playing times. Thus, for me, the more appealing scenario for personal digital video is that of the burned DVD because, with the right DVD player, your “backups” can double as working copies. Thankfully, it’s also much, much cheaper per megabyte than CDs were 10 years ago. Reason 2: Incompatible video formats.